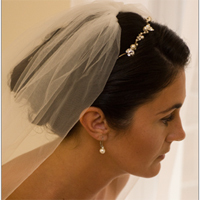 Purchase Elegant Hair Accessories at Adorn beautifully designed by Brides Head Revisited. Recently featured in NY Weddings, Brides, InStyle Weddings, Elegant Bride, Town & Country magazines and many more. Gorgeous Jewelry and Hair Combs with Swarovski Crystals or pearls—whether classic or modern Hair Accessories designs—deserve a resting place on you. At Adorn, you'll find special occasion Hair Accessories that reflect your personal style.